AFC Fylde’s matchwinning hero Ashley Hemmings spoke of his delight after his first goals for the club helped the Coasters seal a priceless win against promotion rivals Wrexham. 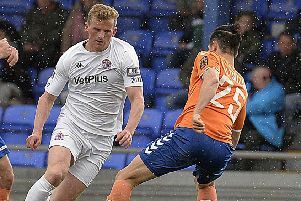 The winger netted both of Fylde’s goals in their 2-0 win at Mill Farm on Saturday, propelling the Coasters up to fourth and cutting the gap to league leaders Leyton Orient to just four points. Hemmings’ brace saw the 27-year-old break his duck for the club after 19 appearances, having signed from Salford City during the summer. The forward has struggled for regular game time this season and was sent out on loan to Altrincham at the start of December to build up his fitness, only to be recalled on New Year’s Eve. But Hemmings couldn’t hide his delight after scoring the decisive goals on a rare start for the Coasters. “We worked hard and everyone played well, it was great to get a clean sheet and I’m happy to get two goals as well,” he said. “It was hard for me to get into the team because the boys were doing great and I couldn’t really go to the gaffer (Dave Challinor) and ask him to put me in the team. Hemmings drilled home from the edge of the box to open the scoring a minute before half-time, creeping a low shot under the Wrexham goalkeeper. He then added a second 10 minutes into the second period with a clinical left-footed finish after being played in by the Coasters’ new signing Dan Bradley. Hemmings added: “For the first goal I just saw that little inch and I thought it was best to shoot as you never know what might happen, it could come off anyone and go in. I was buzzing when it did. After dispatching fifth-placed Wrexham and leapfrogging them in the league table, it doesn’t get any easier for Fylde who face joint leaders Solihull Moors next week. The West Midlands side took advantage of Leyton Orient’s surprise defeat to Ebbsfleet United to join them on 57 points with a 2-1 win at Maidenhead United, Adi Yussuf striking the winning goal in the third minute of stoppage time. While accepting it will be a tough challenge next week, Hemmings is confident Fylde have the necessary tools to claim another win. “It’s relentless in this league,” he said. “We know what Solihull are about, they’re big strong boys and pretty much every player is over six foot.